My name is Norma Chang. 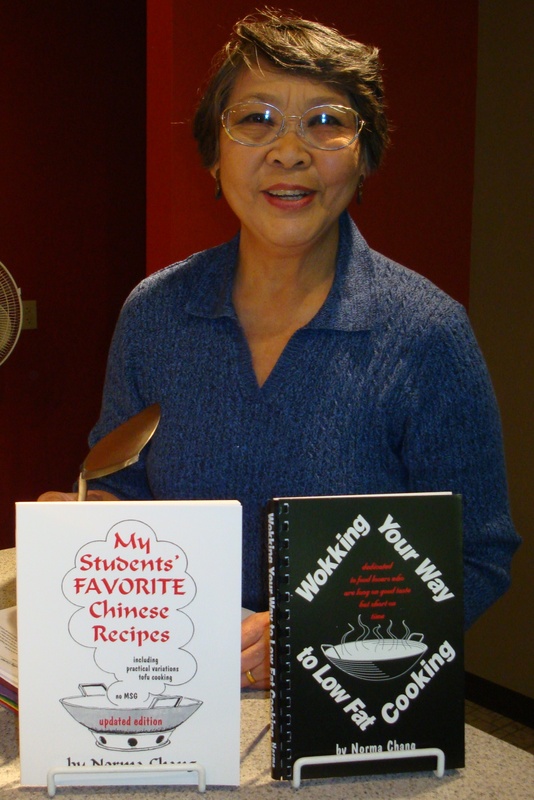 I am the author/publisher of two user-friendly cookbooks: My Students’ Favorite Chinese Recipes (updated edition) and Wokking Your Way to Lowfat Cooking. Please contact me if you are interested in obtaining copies of my cookbooks. I am a gardener who enjoys cooking and eating and love to think outside the box. I am a volunteer at Locust Grove Heritage Vegetable Garden and a Master Gardener Volunteer with Cornell Cooperative Extension Dutchess County. Great idea – I usually can’t do this because I don’t have Facebook! I have always enjoyed getting your good information and hopefully learning from it! Thanks Evelyn. I enjoy sharing the little knowledge I have. YT and I are glad as well that we had the opportunity to get to know you during your stay in the area and more importantly that we remained friends and continued to keep in touch. Hope we will have the opportunity to meet again. Looking forward to your blog’s visits. It was great seeing you this weekend at the Sheep and wool Festival. I always enjoy working with you. Can’t wait to see all your pictures. My Sheep & Wool Festival posting will appear on Friday, October 21, 2011. It’s so much fun to find bloggers from cities and towns from where I grew up in New York State! I’m originally from Hudson, which is in Columbia county. Now I live in Virginia, and love the warmer winter weather! Keep up the good work with the cooking! Thanks for sharing. Thanks for stopping by. Hudson is about 1 hour north of where I live. I would love to have warmer winter weather, but I would also miss the 4 seasons. Were you in Hudson when the Poughkeepsie railway bridge caught fire in l974? It is now a walkway, and when you stand in the middle of the bridge and look up and down the Hudson River, the view is just breath taking. If you have the opportunity to return for a visit you must take a walk on the walkway, here is the link: . Hi Norma, thanks for ther comment. A very interesting Blog you have here, I look forward to reading your posts! Looking forward to your visits. Thanks for visiting my blog. I am not sure how you found me, thank you! Your blog is amazing! So full of incredible information and recipes. I will be back! Thanks, looking forward to your future visits. I found you through your applesauce fruit leather, cannot remember how I strumbled upon your recipe. I stopped by to thank you so much for visiting my blog and for the follow. I hope you find some recipes that you will enjoy. You have a fantastic blog and one that I will be back and looking for more great recipes to try. Thank you for stopping by. Looking forward to your future visits. Yes, I have found recipes on your blog that I enjoy. thank you sooo much for those wonderful books of yours. I already cooked the sweet and sour pork and the lemon chicken. Best recipes ever !!!! My family loved it. This week, tofu is on my agenda…:-). Hopefully, I’ll be able to get decent tofu around here. I do a lot of Chinese / Asian cooking, but your recipes are simply THE BEST !!!! Glad you like my cookbooks and your family loved the recipes you tried so far. Thank you for the compliment. Just found your site through your guest post from everyday maven. I’ve subscribed to your blog and can’t wait to see what’s next! Thank you, looking forward to your future visits. Nice to “meet” you, Norma! Love your blog, and am looking forward to exploring some more. Nice to meet you too. Thanks for dropping and looking forward to your future visits. Thanks for the well wishes. Hi Norma, I just wanted to let you know that I love your blog so much that I have nominated you for an award, see here http://thenewgoodlife.wordpress.com/2012/06/26/tuesdays-top-five-about-me-and-some-awards/. I’m not sure how you feel about this sorts of things. Please feel free to respond to it in any way, if at all, that you like. Thanks for the nomination, I am honoured and touched. I have decided earlier on not to participate in any awards as I have an extremely difficult time deciding who to nominate. I completely understand. I um’d and ah’d over whether to go in for them too. In the end I did a sort of compromised take on them and really just wanted to highlight some blogs new to me that I think others would like to, like yours. I’ll keep reading with interest. Please send me you mailing address, I’m planning to send you the garlic chives before your ground freezes. Thanks for remembering. A friend gave me a clump of flowering garlic chives last week so I now have enough. Received your photo. Those alien looking white spikes are new growth, I think. I really do not know a lot about growing potatoes, learning myself. Maybe if you Google “Growing Potatoes” you can find the info you are looking for or go to the Cornell U. link on the right column of my blog, hope I helped. Thanks and thanks for stopping by, hope to see you again. I am the teen librarian at the Pound Ridge Library and got your name from the South Salem Library. Would you run a summer program for our teens? It would be a Thursday night from 7-9 PM between June 25 and August 1st. Would love to. Will give you a call. Thanks. Looking forward to your visits. Happy spring to you too. Norma, I made the Sweet Potato Noodle Stir-Fry for dinner. It came out fantastic, but I had a real mess trying to cut the cooked noodles into smaller pieces. Is there a simple way to do it? I loved your class today. Glad your Sweet Potato Noodles Stir-Fry turned out fantastic. I use kitchen scissors to cut the noodles. Let me know if using the scissors work better for you. The scissors worked fine. Don’t know why I only tried a knife. My son has developed psoriatic arthritis, besides needing to be gluten free, and is on a very limited holistic diet. I see lots of possibilities with the sweet potato noodles to help him get something new added to his diet. I love your blog! Glad the scissors worked. You can use the sweet potato noodles in soups as well. Try it as a substitute for spaghetti. Check out my posts on growing and cooking with sprouts hopefully you will find them useful. Write again if you need more info. We are learning from each other. All is OK with your URL. Thanks for thinking of me and thanks for the nomination, I am flattered. Early in my blogging, I declined all awards for the simple reason that I enjoy and learn from all the blogs I read and would have a very difficult time selecting only a few to nominate. As long as I am writing a blog we will be BFF forever. I live in the Hudson Valley, New York, USA. Sounds like you live in the tropics, am I correct? Did a little research about Cochin/Kerala and discovered it is a gorgeous place to visit, but to live there year round, that is like on vacation year round, how wonderful. I’ve enjoyed your blog and I’ve nominated you for the Versatile Blogger Award. The rules for the award are to thank the person who nominated you, link back to their blog and nominate 15 bloggers who are worthy to be classified as versatile bloggers. I am glad you enjoy my blog. Thanks for the nomination, I am flattered. Early in my blogging, I declined all awards for the simple reason that I enjoy and learn from all the blogs I read and would have a very difficult time selecting only a few to nominate. Norma, I’ve given you the 2013 Blog of the Year Award. http://creativeartworksblog.wordpress.com/awards/ To accept, here are the directions. http://thethoughtpalette.co.uk/blog-awards-2-/blog-of-the-year-2013-award/ Congratulations, Norma. You do a great job! Thanks for the nomination, I am deeply touched. However, when I started blogging I decided not to participate in awards as I would have great difficulties deciding who to nominate among the many blogs I read and love. I respect your decision. I enjoy your blog very much, and I know you have many loyal followers who benefit from your knowledge. I wish you the very best of success and joy in the future. My name is Jacob Derwin. You know my grandparents, Bonnie and Dan Radwin. When I was younger, I remember attending one of your cooking demonstrations at the library! You might remember me as the little kid who wondered if different colored lettuces tasted different from each other, haha. I want to thank you for the sweet potato noodles! I just received them today from my grandparents. I have been cooking as much as possible in my college dorm at Kent State in Ohio. We only have one tiny kitchen with two working burners on the stove, but I’ve managed to make some tasty homemade meals. In fact, the first thing I began working on was learning how to make a simple stir-fry. I’m getting better with every try, and I continue to incorporate new ingredients. When I return to school I’ll be sure to try your Sesame Sweet Potato Noodles recipe! I nearly have all the ingredients needed already! What a pleasant surprise!!!!! Yes, I remember you well, coming to my cooking programs with your grandparents and willing to try all the dishes prepared. Can’t believe you are now a college student. I understand you are doing exceptionally well. Glad you are continuing your interest in cooking and learning to improvise. Hope you like the sweet potato noodles. Feel free to make changes to my recipes but remember to list the changes you make and the results this way you can go back and tweek the recipe to your liking. Click here for the sweet potato noodles post I wrote. Delighted to find your comment on my blog – my San Diego garden and yours are world apart, weather-wise. I love reading about your garden! Thanks for stopping by and taking the time to leave a comment. Given the delightfully mild San Diego weather I imagine you have a much longer growing season than I do. Are you able to garden year round? Will be happy to send you some slips. Would you please tell me the name of the beautiful purple peony (last photo) on your blog post, “Tree Peonies – A Feast For The Eyes?” How is it doing now, 3 years later? Thank you! Unfortunately I lost the tag and did not record the name of the tree peony you are asking about, so sorry. It is doing very well, thanks. Lovely blog. I want to know more about the Adirondack blue potatoes. Are you growing them this season? Can they grow in winter? Thanks! Sorry for the delay in replying to your comment, I was kind of out of commission. No, I will not be growing Adirondack blue potatoes this year only Blue which I prefer. Where I live they will not grow in the winter, but they may grow where you are check with your local garden center or Cooperative Center. My walking onions have come back to life ! I guess they still did have the bulb! I am so happy ! I had to tell you! So glad to learn your walking onions came back to life, I can picture you smiling ear-to-ear at the sight. I am originally from Goshen, and I now live in the Philadelphia region. My boyfriend and I just bought a new wok, and all of the sudden I remembered about you and for some reason – your old email address, Love2wok@aol.com! I’m 27 now, but I used to go to every single one of your programs at the Goshen Library as a kid and teen. I am definitely going to be checking out your blog! So good to hear from you, wish I could put the name and face together. I am now retired and no longer conduct programs, but glad you had the opportunity to participate. I do miss the interactions that my programs provide especially the teens programs.